Our company provides a full range of garage door repair services that can help every local homeowner with a wide assortment of problems. We can tackle any type of issue, whether it involves the motor unit, the cables, or every other part of the system. We pride ourselves on delivering high quality solutions in a short timeframe, and you can count on us to provide excellent customer satisfaction every single time. The springs that your door relies on to support its weight are only designed to have a lifespan of a few thousand cycles. Some variations can last for up to ten, to even fifteen thousand cycles (as long as they receive the appropriate amount of maintenance, that is). This may sound like a lot, but this means you can expect your springs to begin weakening and wearing out after a few years. When this happens, it’s essential to have them replaced in time; if they break, the results can be extremely inconvenient, not to mention, incredibly dangerous. If your door is beginning to sag or wobble when it moves, and won’t balance properly, or if you start hearing these hardworking components squeaking loudly, contact our technicians immediately. We'll quickly carry out the required spring replacement, and make sure your door is once again able to move safely and smoothly. The most complicated part of your door system by far is the opener. It houses the drive gears and the circuit board, which represent both the brawns and the brains of the system. There are plenty of problems that this unit can develop, but rest assured that our technicians are experts at tracking down the root cause of any potential issue, whether it’s a faulty circuit board, a wiring issue, or some problem with the motor or the trolley. Your door tracks can be damaged more easily than you think, and even the smallest dent can significantly increase wear and tear on the rest of the system. Our technicians will be able to quickly straighten any bent track sections, and make sure the rollers can move inside them effortlessly, and are at no risk of popping out. If the tracks have seen better days, and complete replacement is required, we'll quickly carry it out and make sure the new units are properly aligned. 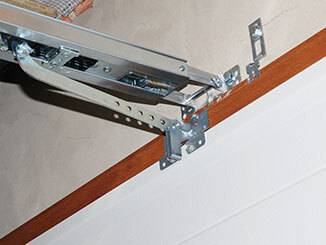 Feel free to contact our experts at Garage Door Repair Darien for any related need you may have. Not only can we fix a wide range of issues, we also provide maintenance and installation services. No matter what the problem is, we’ll make sure you’re completely satisfied with our repairs.